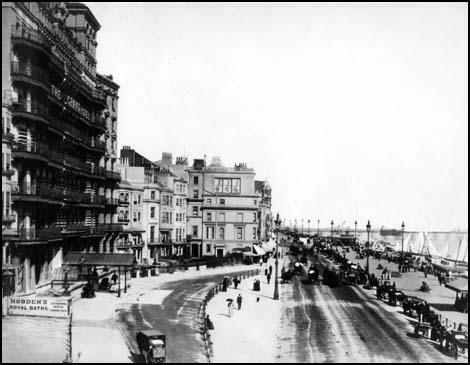 A photograph of the King's Road in Brighton, taken around 1895. John J.E. Mayall's studio can be seen in the middle of the picture. those interested in the history of photography. I can recommend Philippe Garner's excellent book on the subject of Brighton and Photography entitled "A Seaside Album : Photographs and Memory", published by Philip Wilson Publishers in association with The Royal Pavilion, Libraries & Museums, Brighton & Hove (2003). 144 pages, illustrated throughout .